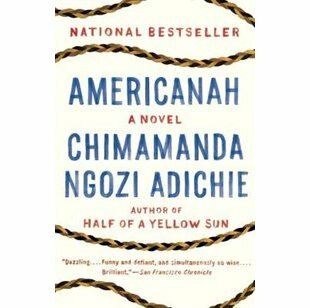 This month at our book club, we read Americanah by Chimamanda Ngozi Adichie. This was my selection so I may be biased but I really liked it. I found it to be an easy read and a fascinating and timely topic. The story is about a woman from Nigeria who has moved to the United States for university and now she has decided to move back home. It jumps back and forth between the present and the past. She writes a lot about racism in the States from the viewpoint of someone who did not grow up in the US. Those observations are so interesting because they are things we take for granted here in North America but do seem ridiculous when seen through the eyes of someone from away. 2016 has been a year where we have heard a lot about racism and how it isn't going away even though the Civil Rights movement happened years ago. I was introduced to many different things that although I know about, I have not really thought about. For example, hair is a topic of discussion. I know that black hair is a "thing", but I hadn't thought about what it means for various people. Relaxed hair vs. weaves vs. natural hair. It's not just about race but about her relationships with her family, friends and boyfriends. This is relatable regardless of race, but being from Nigeria, dating a white guy, and living abroad definitely added some interesting layers to those relationships. I always appreciate a different view of the world, and this was another one to read about. Obviously i have no idea what it is like to be black, but to get the perspective of someone who does is good. Race is a touchy subject and we don't want to offend anyone, but it is something we can't ignore so having more information is useful. In this instance the more information is someone else's viewpoint. Now that I'm in a book club, I'm always looking for good reads to share. This looks interesting! Thanks , Sarah!